Before the soundboard is installed into the instrument, it is coated with a special varnish to protect it against climatic changes. 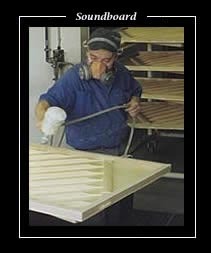 The composition of the varnish is essential for the correct flexibility of the soundboard. The soundboard is glued onto the inner rim, after this has been adjusted to it's curvature. wurde. The rest rail for the iron frame has to be precisely adjusted to the necessary height. Then the holes for the plate screws have to be drilled. The exact position of the iron frame on the inner rim is vital for the correct functioning of the acoustic system and is therefore constantly monitored and controlled.